I am back to blogging after a small break and would be visiting all your blogs shortly.I missed all your yummy posts and my reader is full of unread posts which I would like to cover in a couple of days. Now coming to the recipe,this is a bit time consuming dish but it is still delicious to eat and also a very healthy one as the dumplings are steamed and no frying is involved.The tanginess from the yogurt based gravy is a great compliment to the protein packed steamed toor dal dumplings.One can have the steamed dumplings as it is as a snack or eat them in the yogurt gravy with rice. Soak toor dal in water for 2 hrs. Grind green chillies and salt to a coarse paste.Add soaked toor dal and grind it slightly coarsely. Add grated fresh coconut, finely chopped onions,chopped coriander,curry leaves,chopped drumstick leaves to it and mix well. Grease a plate with oil or line the plate with banana leaf if available. Add a pinch of soda to the batter and mix it well and shape them into round dumplings and steam it for 12-15 mins. Soak toor dal in water for 1 hr. Heat 1/2 tsp oil and roast green chillies until they wilt. Grind the roasted green chillies with salt,jeera,soaked toor dal,grated coconut,turmeric powder and tamarind pulp to a fine paste. Thin the sour/fresh curds and add the ground paste and boil over low flame. once it comes to boil add steamed dumplings and boil for 3-4 mins. Meanwhile heat a small tadka pan and add oil/ghee and add mustard seeds,hing,curry leaves and red chillies and add this tadka to majjiga pulusu. Serve this with rice or eat it in a cup as it is as a snack. The batter for dumplings should not be very thick or thin,it should be slightly looser than the masala wada batter to get soft dumplings otherwise if the batter is very thick you will get hard dumplings. Adding soda will ensure that you get soft airy dumplings. Addition of drumstick leaves is optional,but it is very healthy and adds a nice flavor to it.If you don't get it just avoid it and proceed with the same recipe. 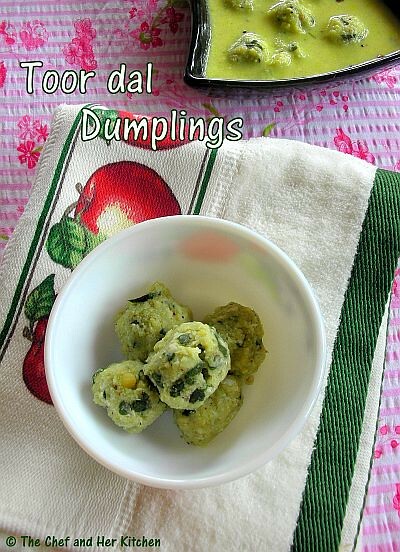 The steamed toor dal dumplings can be eaten as a snack but I prefer them in majjiga pulusu as it adds nice taste to it. You can even crumble the steamed toor dal dumplings in rice and add ghee and eat or you can drop these dumplings in rasam or coconut based gravies for variation.I will post even that version soon in my blog. Urundai Mor kulmabu as we call it here is looking so great. Makes me so hungry thought I finished my lunch just now. 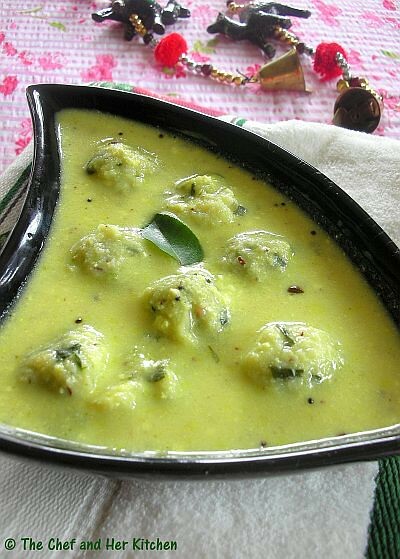 yummy recipe,love to have this delicious balls...luks tempting!!! Looks yummy and nice clicks. That looks superb, wud make a lovely combo with Rice..Slurp!! We too make this, love it a lot! Last click is awesome! Yoghurt gravy looks too good.. never added drumstick leaves. will try next time..
Trust me or not i prepared the same dumplings this weekend, but with bit variation..looks super delicious.. Totally new recipe to me. Looks too good. I love this one, looks super delicious. Dumplings in yogurt has turned out to be simply delicious. This looks lip smacking ~ a great looking dish! 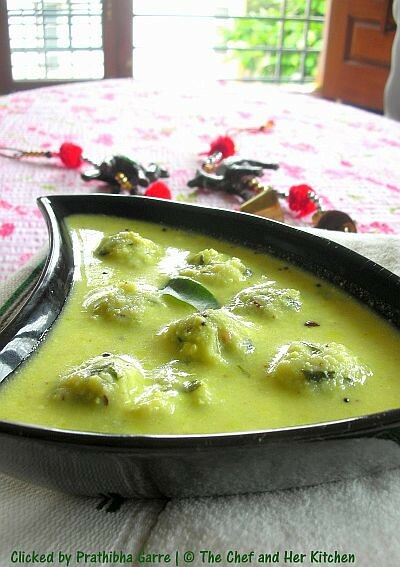 This kind of pulusu more the merrier..
this is such a delicious recipe, steamed toor dal dumplings sounds so interesting, will try it out soon..
very tempting ! Urundai Kuzhambu is what we call it ! 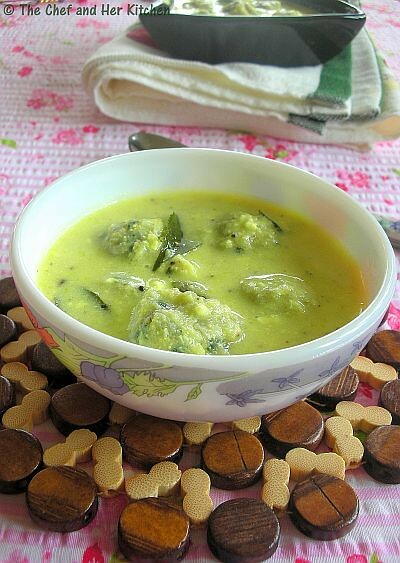 kanduntla pulusu looks gorgeous :D That bowl looks slurrrp!!! I have never tasted these tempting dumplings!!! The gravy too looks mild & mouthwatering..Not loaded with too many strong flavors..Makes for a nice & comforting meal..This is a must try!! awesome looking curry dear....love the combo! Dumplings are always time consuming but they taste divine later on. Beautiful pics. That looks superb, wood make a lovely combo with Rice..Slurp!! Majjiga pulusu luks delicious..tastes yum with white rice..
New to me but will definitely try it out. Yummy recipe...looks tempting and delicious. We make curry with steamed lentil dumplings. this one is new dish to me. Sure i will try. This is new to me. Looks delicious though! Wow!! that sure looks like an easy recipe.. Must try!! When I called one of my relatives in India, they said that they prepared this dish. I love this dish very much. I had forgot the recipe and was searching the net and got yours. Felt "Lucky". Right now I am in the process of making it. Will be another 2 hours before I get to eat it. Thank You very much for this recipe. 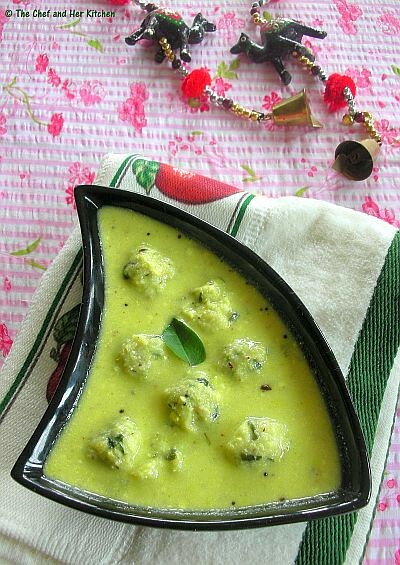 This dish is very popular among the "Vysya Community" in Bangalore ! !